The Devonshire and Buccleuch Docks were constructed by the late Mr Brassey in 1867. At the same time a certain amount of dredging was done to give better access from the sea. A number of impediments in the channel consisted in what is locally called “Scars” and it was soon found that only a limited quantity of dredging was required as, when the “scars” were removed, the sand was cleared away by the action of the water. Unpublished History of Barrow by Sir James Ramsden written in 1890. Every accommodation is provided here [in the Docks] for the discharging and loading of vessels, hydraulic capstans and cranes being placed at suitable distances along the quays…The commodious dock warehouses are fitted with hydraulic cranes of considerable power and for every conceivable purpose. .. Each block of the warehouses is five stories in height and has a floor area of 85000 square yards. 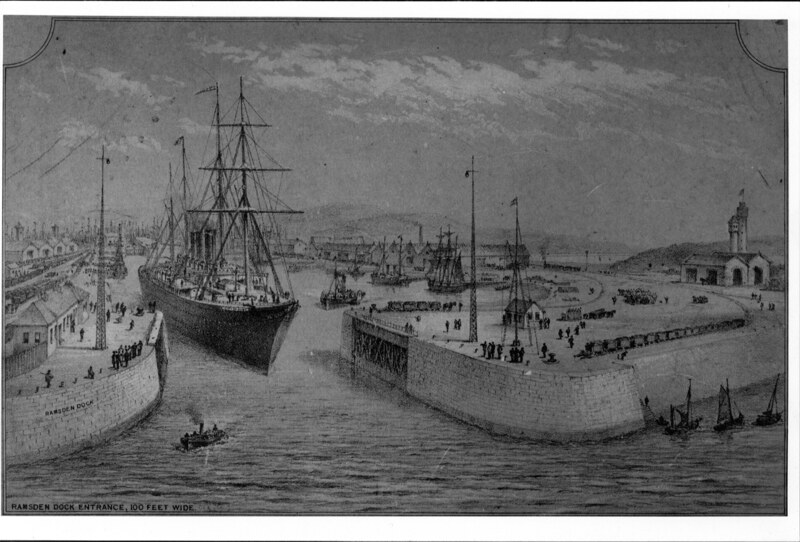 Ramsden Dock was built in the early 1870s and deep enough to float the largest vessels in the world at the time. 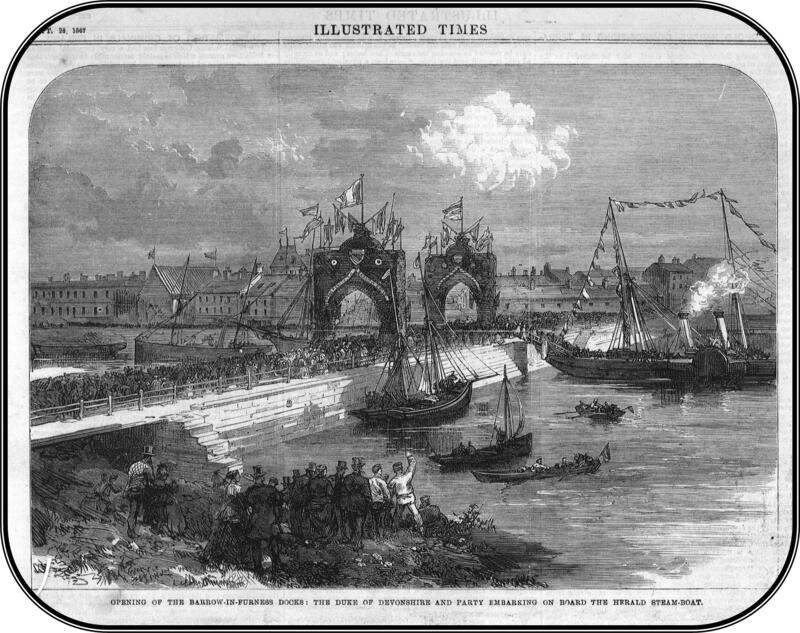 The Barrow Steam Navigation Company used the dock for the steamers which sailed to Belfast and the Isle of Man. The Furness Railway Company built a station on the dock side so passengers could easily access the steamers from the railway system. The docks were originally built and owned by the Furness Railway. Ownership passed to the Docks and Harbour Board and now Associated British Ports. Drawing of The Port of Barrow circa 1880. The buildings on the right of Barrow Island were the huts built to house the workers.